Hair Extensions Brisbane – The Facts! 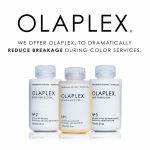 Home » Hair Extensions Brisbane – The Facts! By now you understand that there are a range of hair extensions out there, some look like a bad wig whilst others look utterly seamless and natural. Today we want to inform you about hair extensions Brisbane, so that you don’t make a mistake. 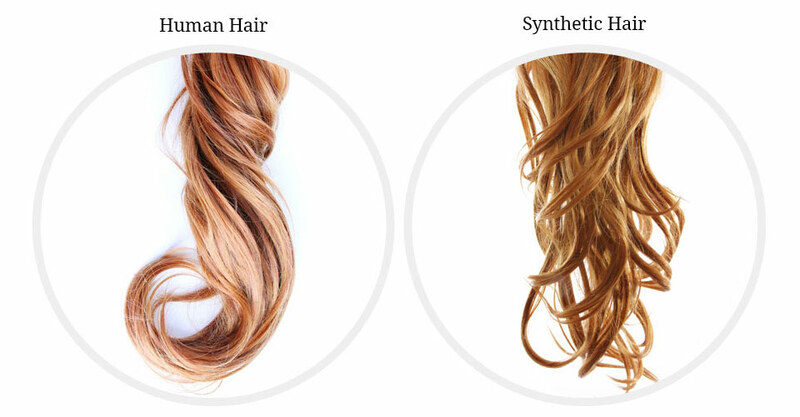 There are two main types of hair, synthetic and natural. As you would expect synthetic is a man-made product and is similar to fishing line in the way it’s manufactured. Whilst ultimately very cheap, synthetic hair extensions will always look funny and fake and can’t be heated or they melt. If you think about it, how can a cheap man-made plastic act the same way your hair does? Which leads us to natural hair extensions. Whilst this will cost more, natural hair extensions make sense as it is REAL HAIR. 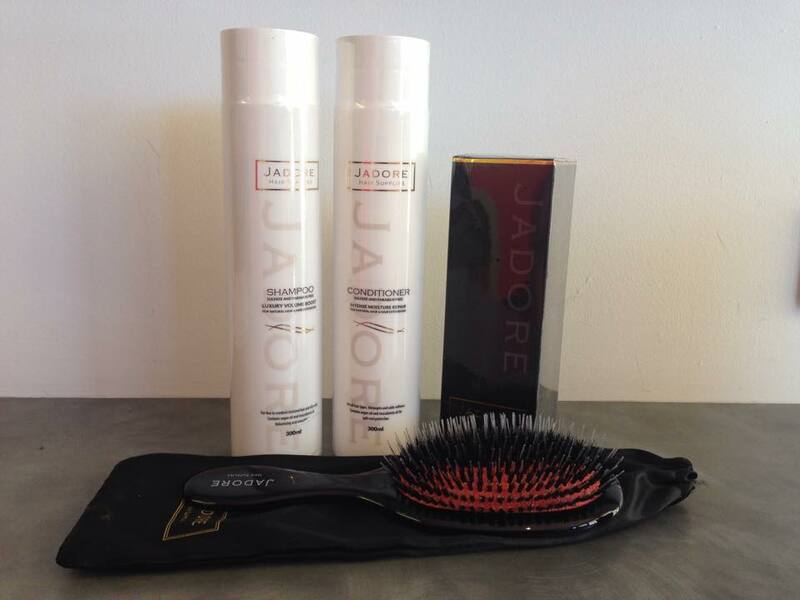 It acts exactly the same way your hair does, it can be heated, straightened and blends perfectly. At Studio Red, we only use the BEST Remy hair extensions made from natural hair. Remy produce the best results, have the highest quality and look amazing. We can order either Indian or Russian hair extensions depending on how the hair flows together with your natural hair. Forget the old elastic band with some dodgy coloured hair attached to it. Hair extensions have come a LONG way. 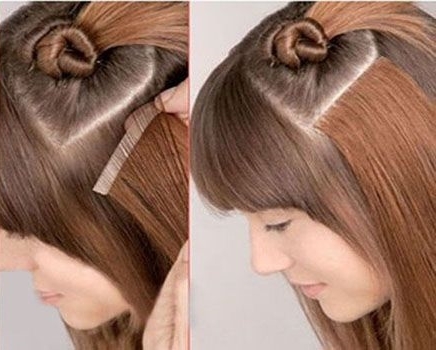 The common methods used are skin weft, tape or ITIP. What does all that mean? Well let’s explain. 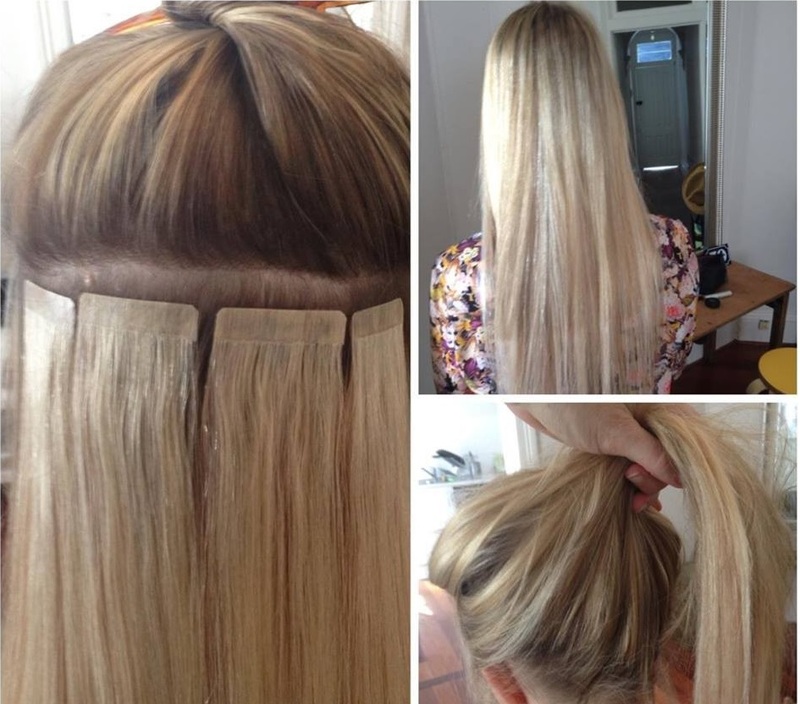 Skin weft: Skin weft is the latest in the tape extension range, they are 100% invisible. If you have thin hair or are conscious about people knowing you have extensions, these are for you. Skin weft uses a ‘block’ of hair to make your hair look long and luscious. These are really used for people that want to leave their hair down, but having amazing looking hair. 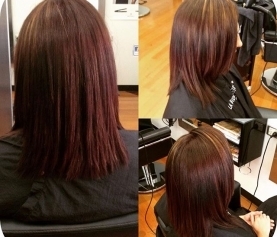 We can use multiple skin wefts to make sure that your hair is matched and looks very natural. ITIP: ITIP hair extensions are a single strand extension that is attached to your hair via a small bead. 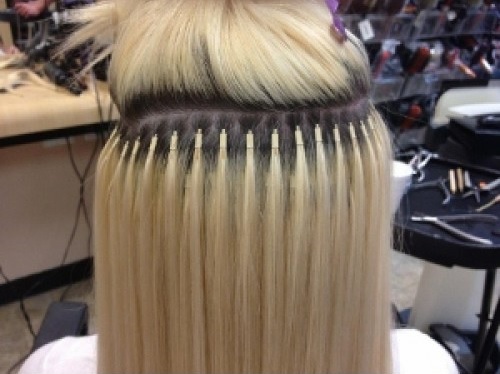 The extension is placed under the majority of your hair so that the beads can’t be seen. This allows the extensions to be placed so they give a great look, but also allows you to have your hair up in a pony tail. All of the hair extensions used at Studio Red Hair Design do not use any chemicals and do not damage your hair. 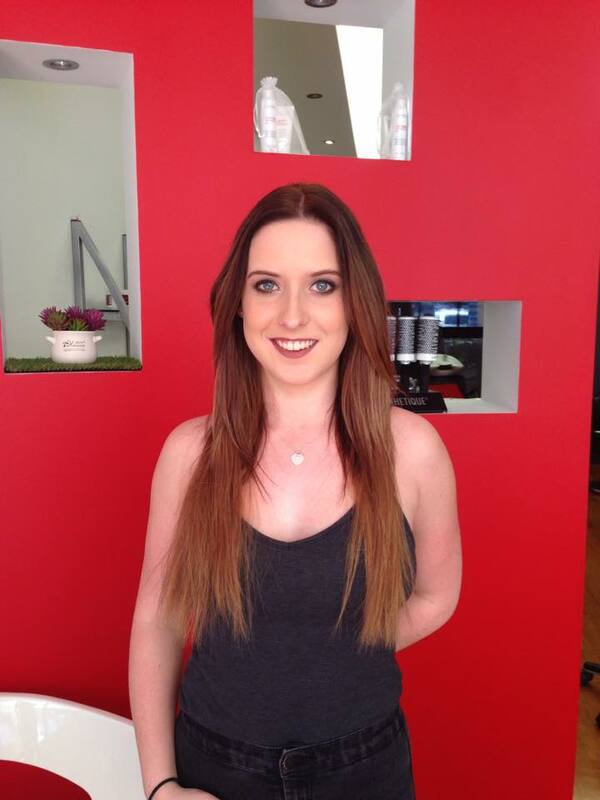 Brooke had always been intrigued about getting hair extensions and came in to see the team at Studio Red. Before we did anything we went through a free consultation, to show the types of extensions and explain what it all meant. We then colour matched the extensions using our colour sample pack. Brooke went with the skin weft and we used two sets of extensions to ensure that it looked natural and we were able to match Brooke’s hair colour. After the consultation we ordered in the extensions and the maintenance pack. Once these arrived (overnight) we arranged with Brooke to come in and get her extensions. Brooke’s natural hair goes just below her shoulders. 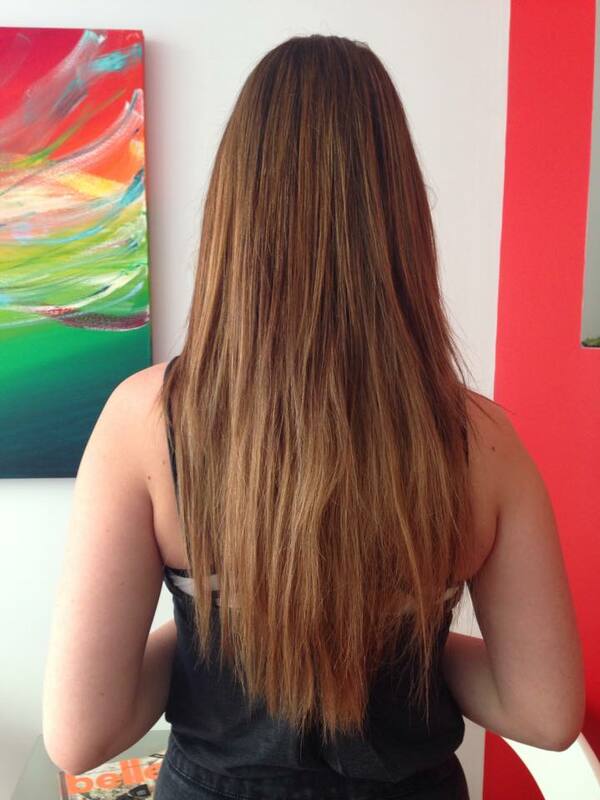 As you can see from Brooke’s results, the hair looks natural, long and amazing. Many people don’t realise that to keep your extensions looking their best and get the greatest results out of them, there is a range of products specifically for hair extensions that you can use. There is specific shampoo, conditioner, oil, brush and a maintenance sheet that help you keep you extensions in their best condition and give them longevity. At the end of the day you are spending good money for your new extensions, therefore you need to take care of them. Hair extensions typically cost between $500 to $600 (we have heard of people paying close to $3000). 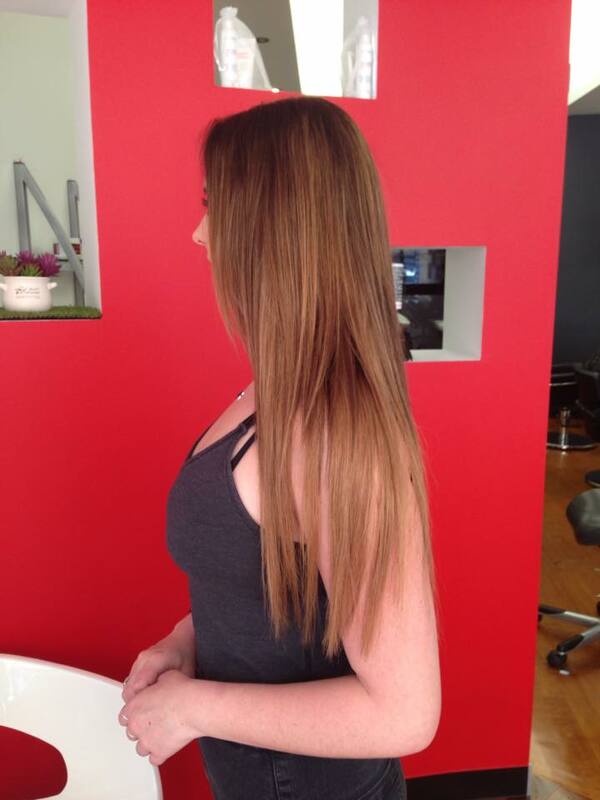 At Studio Red Brisbane our price for hair extensions is only $450!!!! A free consultation, colour matching with our extension swatches, an explanation about the extensions and what is required for the maintenance. This allows you to make an informed decision about your extensions. From there we take a 50% deposit and order in the extensions. These will arrive within 1-2 days of ordering. Studio Red will arrange a time that suits you (this can even be in the evenings during the week) and place your extensions in. So that’s it, all you need to know about hair extensions Brisbane. If you would like to book in then feel free to give us a call on 07 3870 0333.